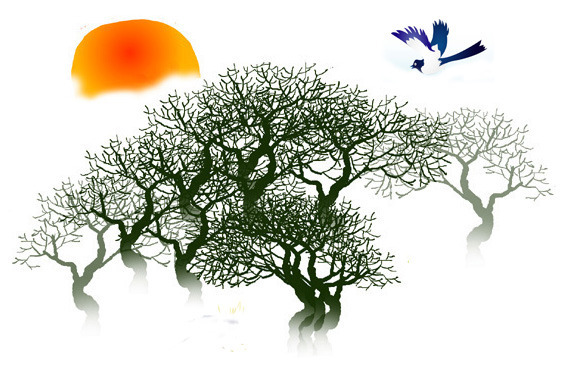 Lunar New Year is a major holiday period that’s celebrated across most of the Asian regions. But just because they all celebrate the new year doesn’t mean the customs and traditions are the same. If you’ve ever wondered how Lunar New Year is celebrated in South Korea, here’s a basic breakdown of the customs, food, traditions, and superstitions attached to this major holiday. And be sure to check out the previous post on travel tips in Korea during Lunar New Year if you haven't done so! 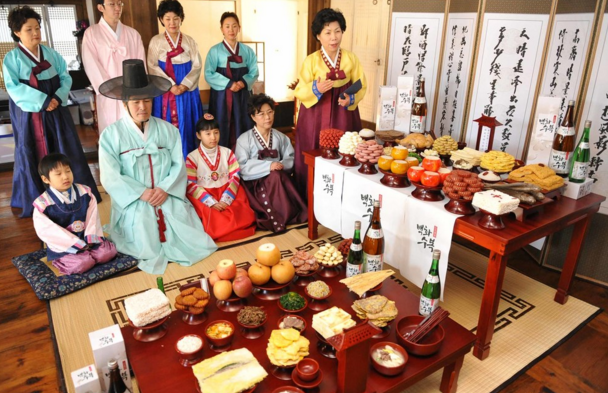 The day before new year's is a furor in a typical Korean home. Families will have gathered together (usually at the eldest grandparent or uncle's home) and the house is cleaned thoroughly, and the table and ware for the jesa (ceremony to pay respect to the family's ancestors) are prepared for the ancestors of a family to pay respect to them. The kitchen is particularly busy as a big feast is prepared for the jesa table the next day. However, even the jesa table is quite complicated including rules on what food goes where, direction of the table, etc. Most of the dishes don't deviate too differently although there are some regional differences depending on your home region. When all is laid out on the jesa table on new year's day, the whole family will gather to do the jesa ceremony by bowing to the ancestors, offering incense and drinks, and praying for good health, luck, and prosperity for the family in the year ahead. Afterwards, families usually have a big feast of the food preparations. Almost any large family gathering in any culture will generally revolve largely around food and Korea is no exception. 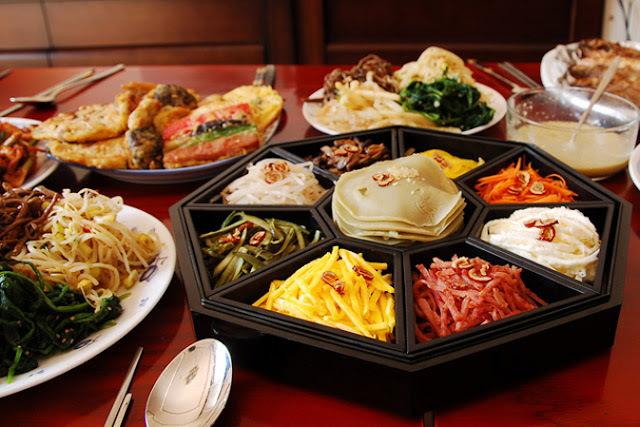 A range of dishes are prepared traditionally in Korean homes around Lunar New Year that boils from main dishes to sweets and drinks. 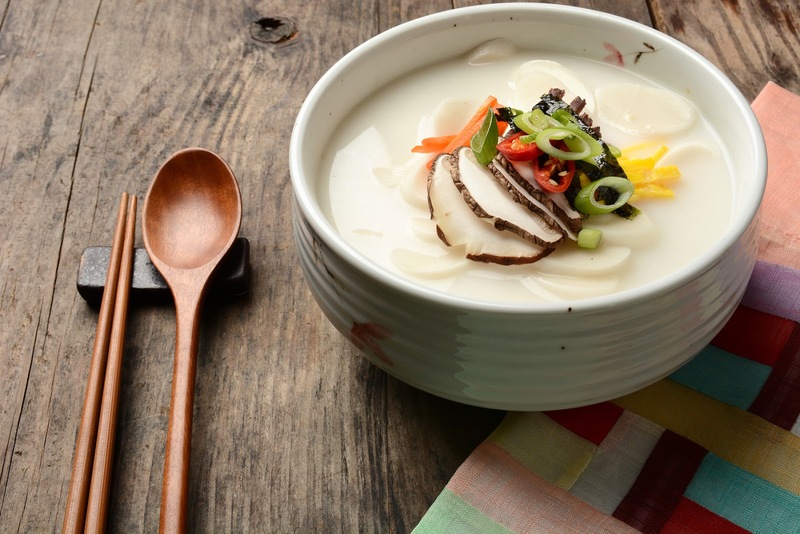 While some of the main dishes prepared can vary by family and the region they are from, one dish that is ubiquitous across all Korean families is tteokguk (or rice cake soup). This hot soup dish is made with a protein-based broth (most commonly beef) in which seasonings and sliced plain, oval-shaped rice cakes are cooked and then topped with chopped scallions, cooked meat, toasted laver, cooked egg. 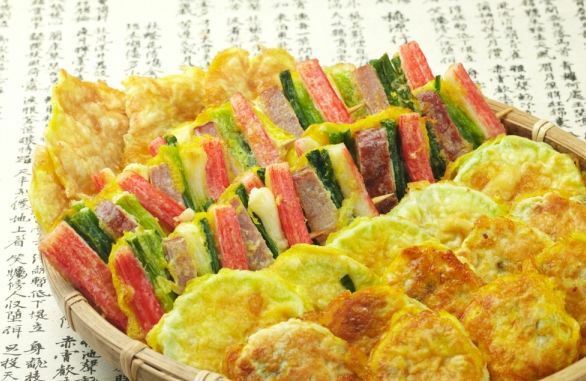 Eating tteokguk is not only thought to usher in good luck for the new year but on a significant level it reflects gaining a year older under Korean age when everyone turns a year older on New Year's Day. The whiteness of the rice and soup is also said to reflect a pure body, mind, and heart as one enters the new year. Though all families will eat tteokguk, there are different variations of the dish including an oyster broth-based tteokguk in certain coastal regions and different shaped rice cakes such as the mini snowman-like joraengi tteok used typically in tteokguk of the Gaesong region. Other families also add homemade mandu (dumplings) to make it into more heartier dishes like manduguk or tteokmanduguk. Various jeon (battered and fried dishes) are also typically prepared such as meat jeon, fish jeon, oyster jeon, coin-shaped donjeonya (although it's more commonly called dongeurangddaeng), nokdu jeon (mung bean jeon), and also skewered jeon (where a range of rectangular shaped jeons are skewered and fried to make a colorful jeon). Other dishes you may find on the table include galbi jjim, jabchae, pyeonyook (boiled meat), squid or octopus (served plain after boiling or mixed in a spicy sauce), etc. 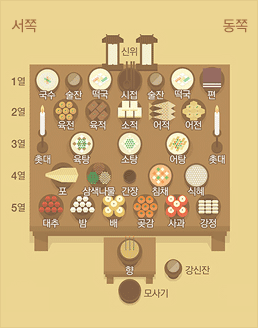 Dessert dishes include various tteok (rice cakes), gangjeong, yaggwa, sujeonggwa, sikhye, etc. The most popular tradition for children is called "Sebae" in which typically young children (but sometimes even adult offspring) pay their respect to their elders (parents, grandparents, and even uncles and aunts) on new year's day with a traditional, respectful bow. In this tradition, the young children (and sometimes even the elders receiving the sebae) are dressed in colorful hanbok and line up in a row with their elders (usually by generation) seated in front of them. Together, the children will then perform a traditional bow to the floor while saying "saehae bok mani badeusehyo 새해 복 많이 받으세요" which means "please receive much fortune in the new year." 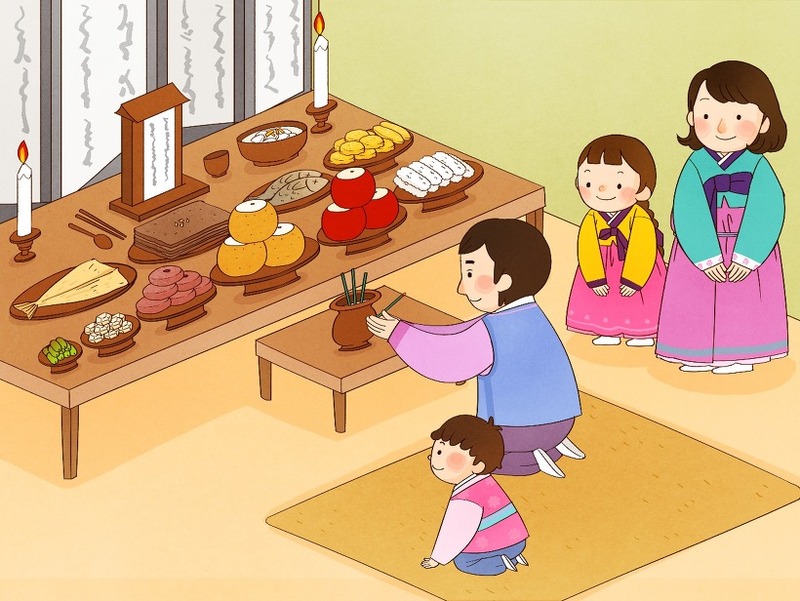 The children will then take a seat as the elders will typically bestow a word of wisdom (called dokdam or 독담) for each child as they enter the new year. 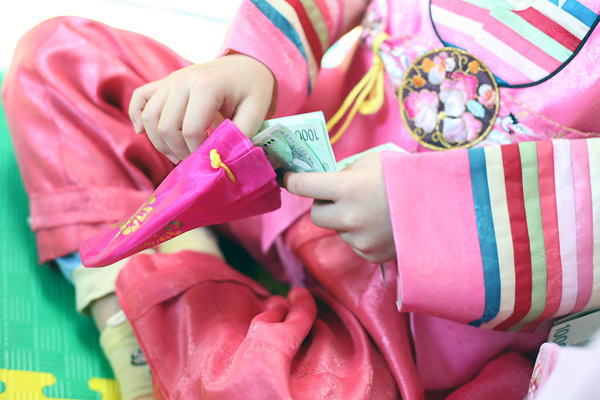 After, the elders will typically "reward" the children by giving them "yongdon or 용돈", new year pocket money. 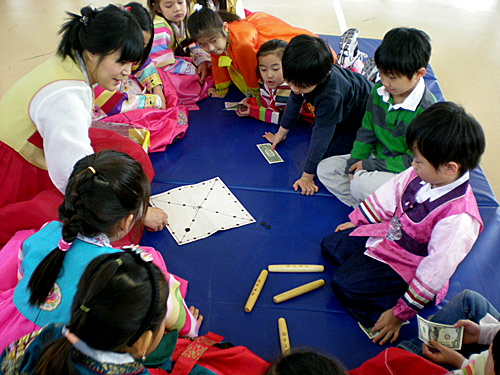 Thus Korean children look forward to Lunar New Year's in the same manner kids in many parts of the world look forward to holidays like Christmas or Easter every year. Cut-off for being the recipient of the yongdon varies by family- some by the time you enter university, some even until you graduate university! And at some point, you are expected to receive the sebae and even offer yongdon to the younger generations (usually when you get married but in some families when you start working as an adult). 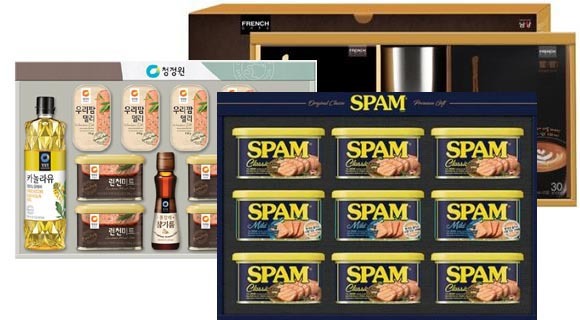 In addition to travel and food costs, another reason that makes Seol typically an expensive holiday is that the giving and receiving of gifts is also customary. While in the past typical gifts included rice, meat, fruit, clothing, shoes, etc, these days gift "sets" are sold at department stores, shopping malls, supermarkets and more ranging from expensive fruit baskets to packaged sets that include a potpourri of food items such as cooking oils, premium nuts, dried seafood, and even cans of Spam (yes, Spam). These gift-giving also extends beyond homes to typically workplaces as well when one's company usually bestows each employee a gift as well which can range from company bonuses to toiletry sets (shampoo, conditioner, toothpaste, soap, etc). 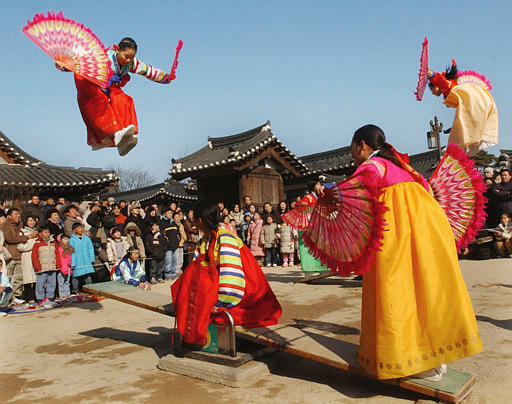 Folk games were traditionally a major part of new year festivities for Koreans. 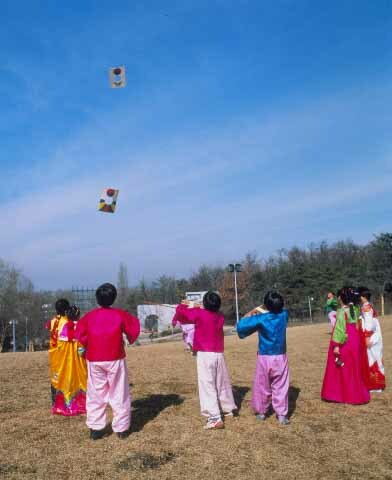 Kite flying was usually done by boys and men starting on the lunar new year and leading up to the new year’s first full moon day. On the day of the first full moon, kites would be flying high in the sky before having the kite string cut with the kite said to fly away carrying with it the bad omens and fortunes. For girls and young women, neol ddwigi (널 뛰기) was a popular activity in which a long board would be laid atop a stand of some kind to create a seesaw. Two people would stand on opposite ends taking turns jumping and launching the other into the air and back and forth. These and other traditions are far less observed in today's age but one game that still persists is yut nol ee (윷놀이). With a board and markers, players take turn throwing the four yut sticks in the air. 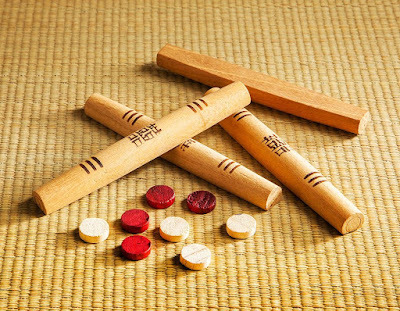 Their landing, depending on how many sticks are face down/face up, determines the number of moves the player can make on the board. The goal is to get all four of one's markers around the board. Along the way, players can send the opponent's marker home by landing on the same spot or even combine one's own markers (if their markers land on the same spot) if they feel it's strategically advantageous to do so. 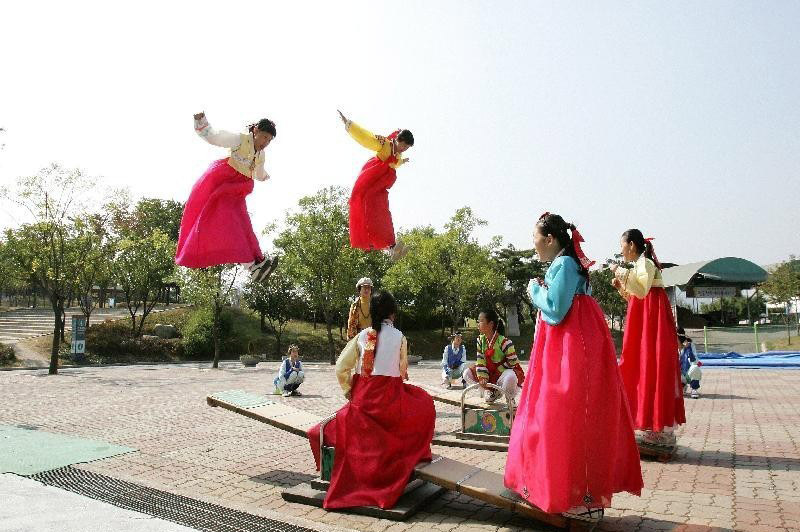 Though not quite relevant in today's age, Lunar New Year in the past for Koreans came with quite a lot of superstitions attached to it. Many of them had to do with the first day of the lunar new year. For example, in the past it was considered unlucky for grains to leave a household on new year's day as it would mean the household's wealth would also leave the house in the new year. There were even restrictions on women visiting another household as it was said it would bring bad luck to the visited household. Other superstitions included good or bad fortune for the new year said to be determined by whether one would hear a magpie in the morning (good) or a crow (bad). There were even superstitions associated with the agriculture for the new year in which one would pull up a barley root and if there were more than three strands would signify a bountiful harvest, two would mean an average one, and one root strand would mean a poor harvest. These superstitions are now things of the past but it reflects just how seriously Koreans took fortunes for the new year!